Colonel Buer was commissioned through the Platoon Leaders Class in 1988. Assigned to Marine Light Attack Helicopter Squadron (HMLA) 269 at Marine Corps Air Station New River, North Carolina, he completed conversion training from the AH-1J to the AH-1W Super Cobra. 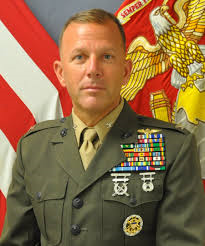 From 1991-1996 he completed multiple Marine Expeditionary Unit deployments throughout the Persian Gulf, Norway, Somalia and the former Yugoslavia. From 1997-2000 he was assigned as the Inspector/Instructor and Operations Officer for HMLA-773 Det A at NAS Willow Grove, PA. In 2001, he returned to 2d Marine Aircraft Wing and served as the Deputy, Assistant Chief of Staff, G-1. Reassigned to HMLA-269 in 2002, he deployed with Task Force Tarawa in support of OPERATION IRAQI FREEDOM (OIF) in 2003. In 2004, he reported to Camp Pendleton, CA and assumed command of the ‘Coyotes’. While commanding the ‘Coyotes’ Colonel Buer deployed, in 2004 and again in 2005, to Al Taqaddum, Iraq in support of OIF II and OIF 04-06. In 2007, Colonel Buer was assigned to the Joint Staff J-7, Operational Plans and Joint Force Development Directorate. In 2010, he reported to the National War College as an Associate Professor of National Security Strategy and Policy. In 2012 he deployed to Kabul, Afghanistan as a Special Advisor to the Commander, US Forces Afghanistan. In 2013, he reported to NAS Pensacola, FL as the Commander, Marine Aviation Training Support Group 21 and retired in 2016. Colonel Buer has more than 4,000 flight hours along with 363 combat sorties. He is a graduate of the Weapons and Tactic Instructor Course (1994), Amphibious Warfare School (1997), USMC Command and Staff College (2001) and the Marine Corps War College (2007). Colonel Buer’s civilian education includes: B.S. Economics (Ohio Wesleyan University), M.B.A. (LaSalle University), Master’s of Military Studies (USMC Command and Staff College) and Master’s of Strategic Studies (Marine Corps War College). Colonel Buer’s personal awards include: Defense Superior Service Medal w/OLC, Legion of Merit, Distinguished Flying Cross w/ combat ‘V’, Meritorious Service Medal w/ gold star, Air Medal w/ combat ‘V’ gold numeral 2 and Strike/Flight numeral 17, Navy and Marine Corps Commendation Medal w/ gold star, Joint Service Achievement Medal and the Navy and Marine Corps Achievement Medal.